Revenue in Macau's casinos fell by more than a third in November from a year earlier as China's corruption crackdown continued to drive away some punters. Official numbers showed revenues down 32.2% for the period to 16.4bn Macau patacas ($2.05bn; £1.36bn). Expectations were for a fall in revenues of just over 31%. Macau is the world's largest gaming centre - ahead of Las Vegas - and the only place in China where casinos are allowed. A special administrative region of China, Macau's economy relies heavily on gambling and shopping - especially by big spending tourists from the mainland. But Chinese President Xi Jinping's campaign against corruption and luxury spending, which began in December 2012, has seen officials and others from the mainland more wary of gaming and spending in the city. China's Communist Party prohibits officials from gambling, but until the 2012 crackdown, officials had reportedly visited Macau's casinos to gamble and spend. 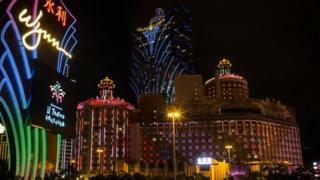 China has emphasised Macau's need to diversify its economy away from gambling. The city's build up of new resorts and hotels is expected to help drive general tourism, however, analysts have said Macau will be hard-pressed to build up non-gaming streams of revenue in the near future. Official numbers released on Monday showed the city's economy shrank by 24.2% year-on-year during three months to September, the city's Statistics and Census Service said. "Economic contraction in the third quarter was attributable to the continuous decline in exports of services, of which exports of gaming services decreased by 37.4% year-on-year and exports of other tourism services dropped by 15.3%," it added. Once a Portuguese colony, gaming has taken place in Macau for more than 300 years. For many years it was referred to as the Monte Carlo of the Orient. The city was returned to Chinese rule in 1999.